Why throw away your bouquet when it can be preserved and enjoyed for years to come. For the best preservation results it’s essential we receive your bouquet within the first few days after your wedding. Just Married in South East Queensland? If you live in South East Queensland, please phone 1300 737 670 for our FREE Courier Collection Service. If you live outside of our free bouquet collection area you will need to pack your flowers in a box. We recommend purchasing a mailing/storage box from Australia Post. To pack your bouquet, place scrunched up tissue paper or newspaper in the bottom of the box. Place the bouquet on top of the paper then place more paper around the sides of the bouquet so it is supported. If you’re using newspaper, place some kitchen towel or tissue paper directly on top of the flowers to prevent the newspaper from staining (particularly with white flowers). With longer bouquets you may need to bend the trail or cut off the last few flowers to fit it into the box. You don’t need to worry about doing this as we will be disassembling your bouquet as soon as we receive it. If your bouquet is packed with care, the flowers will arrive at The Flower Factory in the same condition as when you sent them. Please put your name, address and phone number in the box with your flowers. 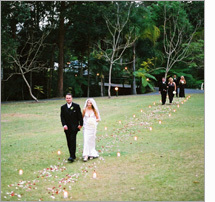 We recommend using Australia Post guaranteed next day delivery to return your bouqet to us. We have found this to be a very reliable and cost effective option costing approximately $35.00 – $45.00. The above freight & post estimates are based on a mailing/storage box 405mm long x 300mm high x 255mm wide. A larger box will incur extra freight costs. A $200.00 reservation deposit is required when booking in your bouquet. We then send you out a brochure from which you’ll select a frame. 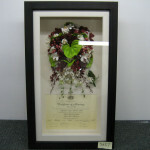 Your frame selection and a 2nd payment of $200.00 are required 4 weeks after your wedding date. The remaining balance is due on completion.